Home » Posts » Mid-Week Focus » Drop Distractions in the Distraction Bag! If you’ve been following the news lately, you may have noticed, as I have, that the word distracted keeps popping up. Many teachers today face some students who are prone to slouching in seats, gazing off during instruction, struggling with anxieties, calling out, and growing restless more readily than students in past years. The word distraction may very well be popping in these educators’ ears. These teachers need a DISTRACTION BAG that they can use to engage kids in consciously de-cluttering their minds as they enter class or get ready for the first lesson of the day. How? 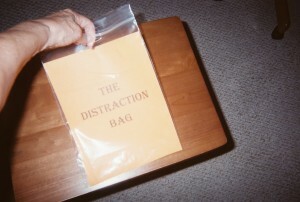 By using the bag to act out the process of ditching distractions…dropping them out of sight…out of mind. If children in grades K – 5 today have trouble paying attention in elementary school now, imagine the challenges they will face as they age into higher grades and adulthood later. Attention problems are not limited to children in elementary classrooms. Loss of focus now plagues people over 50 years old as well, according to research conducted by AARP. Call it what you like, the root cause of the “attention crisis” is almost always identified as technology-based stimuli that come in droves and can scramble the best brains. Clearly, technology is here to stay and smart teachers embrace technology in the classroom when it’s practical and possible to do so. But, sometimes low-tech is best. A DISTRACTION BAG is obviously a “low-tech” attention-getting tool. Does it work? I’ve tested it out and it’s a winner. Take a closer look at how simple it is! 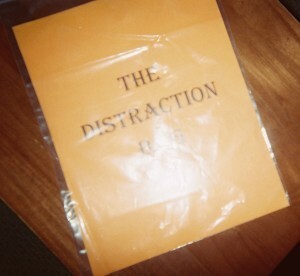 A DISTRACTION BAG can simply be a large clear, easy-to-open plastic bag with a title page that identifies its purpose. A DISTRACTION BAG is nothing more than a large clear – and clearly identified – plastic bag that a teacher can easily open in front of students. Kids immediately get the humor in it. Remember, humor is a huge FAB-15 A-GE – attention-getting element. As time allows, make the connection with your K – 5 kids, in age appropriate ways, that dropping distractions into a DISTRACTION BAG is a great way to de-clutter our minds and create a new sense of organization and focus. You might offer students in grades 4 and 5 an analogy between de-cluttering a mind, for example, and de-cluttering one’s desk. Kids might even be cool with keeping a personal DISTRACTION BAG in their desks. Large clear, easy-to-open plastic bags are inexpensive. Turn them into DISTRACTION BAGS and you have classroom management and teaching tools that are worth their weight in gold! Hope you’ll stop by tomorrow for Part II of International Festival of Attention-Grabbers – Vietnam. 12 Pings/Trackbacks for "Drop Distractions in the Distraction Bag!"